Fathers and sons don't always see eye-to-eye. In fact, some men have no relationship with their fathers...period, many by choice. These three are fathers that are there for their sons but not really there, you know? These are stories of emotionally distant men with second chances but only if father and son, and even if they don't know it, can trust in each other enough to work together. 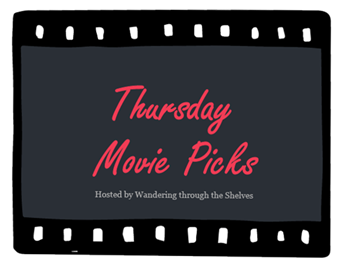 It's the return of the All in the Family Edition of Wandering through the Shelves' Thursday Movie Picks. This time biologically related fathers and sons. Every time I watch this movie, I feel closer to all the people out there who love movies. "Back to the Future" is the kind of movie that seemingly all people have in their grasp. It sort of binds us together, at least in my experience. As for the father-son aspect, it drives the film. First, you have Christopher Lloyd's famous, wild-eyed time machine inventor, "Doc" Brown, who is certainly a father figure to Michael J. Fox's Marty McFly. 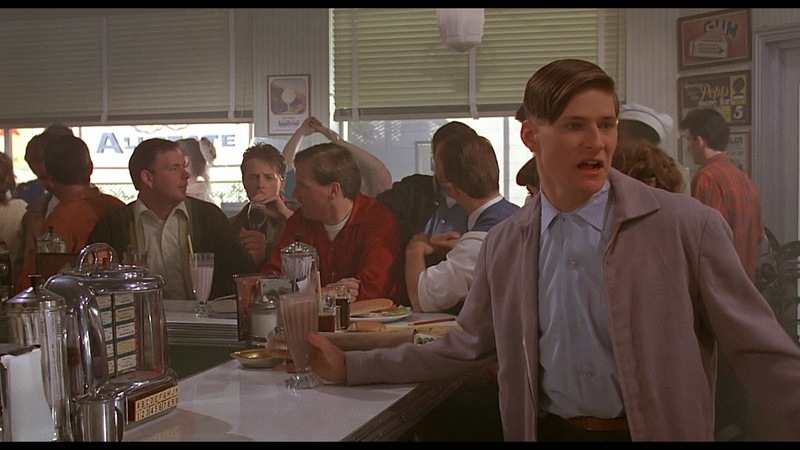 Then, you have Marty's biological father, the weakling and pushover, George McFly (the great Crispin Glover). When Marty is accidentally sent back to 1955, his presence there sets in motion a sequence of time altering events that may very well erase him from existence. What would it be like to give dating advice at 17 to your 17-year-old father? Just one of the many mind-blowing questions posed in this classic. Every time I watch this movie, I feel nothing but warmth and joy. It moves me to tears every time. Kevin Costner plays Ray Kinsella, an Iowa farmer, who never got over the falling out he had with his father, a former baseball player, years earlier. A voice asks him to build a baseball field in his corn. The journey this leads him on is one that will mean more than anything else in more ways than one. This is a beautiful story of faith and redemption and our connection to baseball. It's also beautiful to look at. 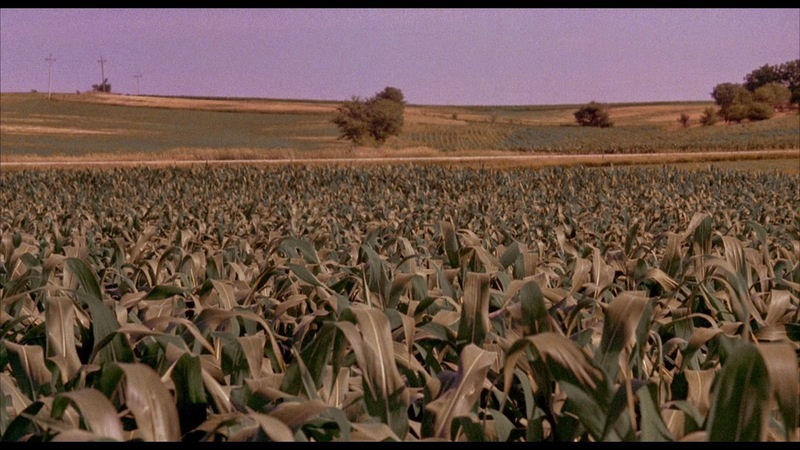 In one scene, the camera follows a ball player, long dead, a ghost named "Shoeless" Joe Jackson, into a corn field from from above and follows the tops of the stalks to the horizon, day changes to dusk atop a sweeping, patriotically American movie score, and then two guys play catch. It's a sequence more memorable than just about any other for me. Click here for my essay on this masterpiece, which was written last spring in honor of the new baseball season. Every time I watch this movie, I feel changed. 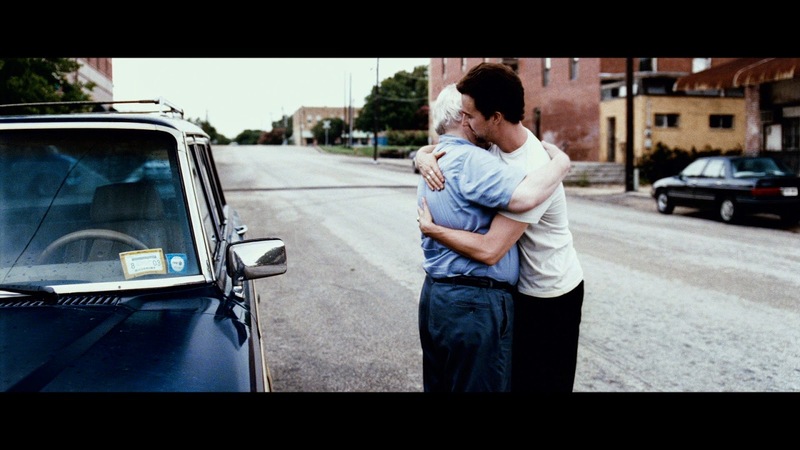 It all has to do with a father-son scene, featuring the hero, Monty Brogan (Edward Norton), a man on his way to serve seven years in prison, and his father, James (the great Brian Cox). It is one of the most poignant and perfect movie scenes ever crafted in a movie that constantly reinvents itself as you watch it (and with repeat viewings). Director Spike Lee was fully on his game with this one. As was screenwriter David Benioff (who would become the creator of HBO's "Game of Thrones"), who adapted his own book of the same name. Together they made both a devastating character study and a love letter to post 9/11 (circa 2002) New York and the people who live there. The supporting cast is incredible. Philip Seymour Hoffman. Barry Pepper. Rosario Dawson. Anna Paquin. One of my Top Ten of the 00s. Like I said on Twitter...so awesome to see 25th Hour here! We've talked Field of Dreams before...I never connected to it, but I see why it's here, and I love when someone else has such a deep connection to film. It just connected with me at the right time and never left. I love watching it. I watch it at least once a year, usually at the beginning of baseball season. 25th Hour is one of the masterpieces of the early 00s. I can't get enough of it, and it's really a sort of bleak story. Just so well made and so hopeful in the end, thanks to the great Brian Cox. Three great picks. Sadly, I've never watched Field of Dreams from beginning to end, only in pieces. I should fix that. Back to the Future is a true classic and 25th Hour is one of Spike's best. Thanks, man. Field of Dreams truly touches my heart. I love it! I definitely expected Back to the Future to appear on someone's list this week. Haven't seen the other two yet. Back to the Future totally plays. Haha! Both of these others are classics, in my opinion. I love Back to the Future, one of my favorite films. Haven't seen the others, but I do kinda love how America makes very patriotic movies, I swear no country does it better. It's funny. All three of these picks really are truly American...and really patriotic. I don't know how that happened. I think that may be how I see father and son relationships. As a type of connection not only to each other but also to country. I haven't seen anything but Back to the Future. It had great depiction of father-son relationship; it happened again in the sequel, but the first is better, IMO. The first is definitely the best. But the sequels are so much fun as well. I love seeing The 25th Hour here! That's such a wonderful film. Admittedly I'm not the biggest fan of Back to the Future and Field of Dreams, but they definitely fit with these categories. Nice job! Thanks. 25th Hour is so great! The other two are just icons from my childhood that I can't ever let go of. Both are beautiful to me in their own right. I'm slightly embarrassed to say that Back to the Future never even crossed my mind for this one! And I LOVE that movie! Expected Field of Dreams to show up a lot this week. 25th Hour is so great. Nice picking! Thanks, man. Back to the Future was really fresh on my mind, since I just watched the whole trilogy for the ??? time. Got the Blu-ray set for my birthday. Field of Dreams is an all-time top five for me. Always will be. I love your first two picks are they fit so well. Back to the Future is such a joyous fun ride and that it has something to say as well is icing on the cake. Haven't seen 25th Hour. 25th Hour is really worth seeing. Very powerful stuff. For all their silliness, the Back to the Future movies have a lot to say about family and country, so iconic to me. The first one especially connect, as I've lived most of my life in my hometown (my father's hometown). Field of Dreams always hits me hard and makes me so happy. It's a nice movie. So few are. These are all wonderful choices, especially 25th Hour! That one is absolutely perfect. I don't really remember Field of Dreams, except for bits and pieces. I'll check out your essay soon. Or better yet, I'll rewatch the movie and then read your essay. Just curious -- have you read the book Shoeless Joe, upon which Field of Dreams was loosely based? Again, it's something I don't remember well, but my mom loved that novel. I have not read the book, mostly because I've seen the movie so many times but I may well check it out. I usually try to read a baseball themed book each spring. Please do re-watch it and let me know what you think of my little short essay. I've only seen Back to the Future from your list, and that's a great pick for the theme! I still have to watch Field of Dreams and 25th Hour, with the former being on my watch list for the longest time. Thanks. I had it on the brain as I had just watched the trilogy for an essay I was writing. Field of Dreams is very special to me. I never get tired of watching it. 25th Hour is hard hitting and powerful. One of Spike Lee's best. Three great movies in your picks. I was so close to picking Back to The Future. No. You're not a loser. You just need to pick up a win by getting to Back to the Future. It should be seen. It's like nothing else.